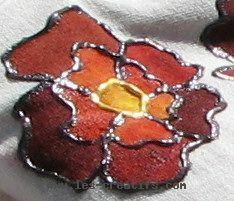 We've used the basic colors from the Javana Tex Sunny brand (air-drying, washable up to 140F°): carmine, lemon, dark brown. 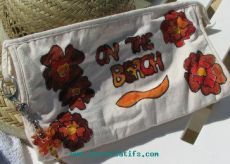 Tip: to make sure the paint holds well to the fabric, before you start personalizing the bag, it's best to wash and iron it well to get rid of any finish (e.g sizing finish). 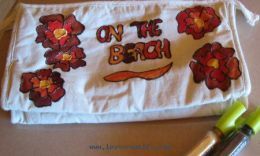 First, using a fine-tipped felt pen for fabric, draw on the outlines of flowers and any words, drawing differently-sized flowers on the surface of the bag. 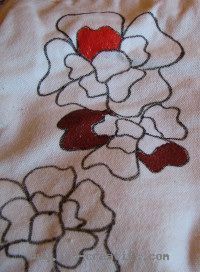 The flowers and words are drawn freehand. To draw a flower: first draw the flower center (a wavy circle), then add 5 big petals, and finally, inside each petal, a smaller, equally wavy petal). Apply the paint with the paintbrush. In order to get the different shades you want for the flowers and painted words using only 3 colors to start with, you'll have to put a little bit of each color into a small plate and load your brush with 2 different colors at the same time, then paint using delicate brush movements.